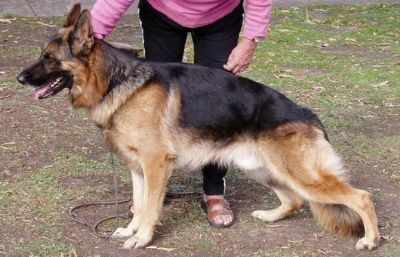 Well above medium size, medium strong, substantial dog of overall very pleasing type. A dog of good proportions and colour. Very good strength of head, good breadth of skull and upper and lower jaw. Very good length of neck. High withers firm straight back. Very good fore and hindquarter angulations with good breadth of thigh. Stands correct in front. Moves correct front and rear. In both the walk and gait he shows a powerful hindquarter drive with very good reach where the back remains firm and the height of the wither is maintained. Presented with confidence and is gun sure.